Above: Both designs shown from above with lettering. 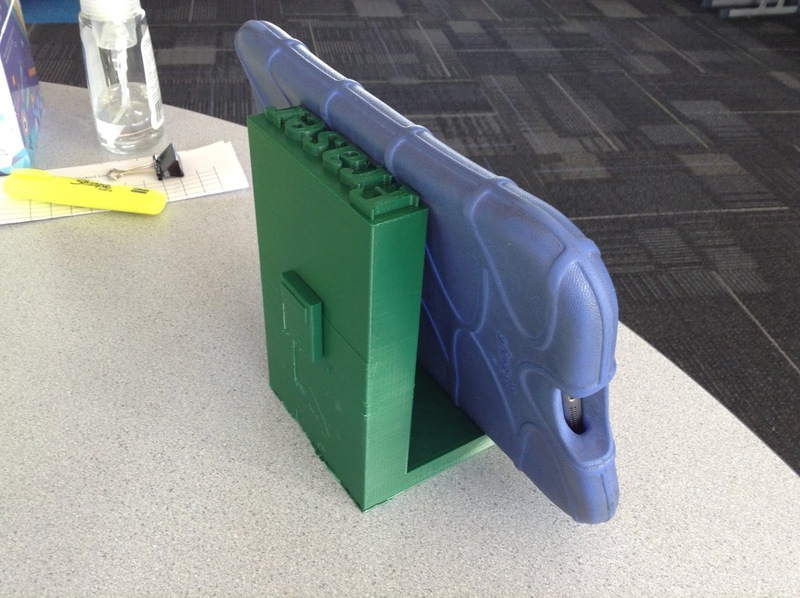 Challenge: For students who are new to 3D Printing to start with something effective, simple but creating a useful tool that would be able to be used in the classroom in a positive way. note, the second student was a student who required and worked with learning support. 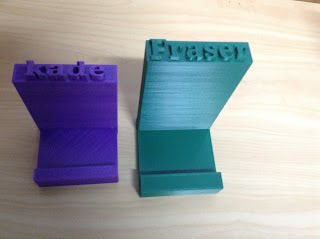 In both cases the students were able to use Tinkercad to manipulate the basic design and add their own names to the lettering. The back of the green design originally contained or had a truck design on it, as printing progressed it was obvious that there would be problems with its rafting removal, as this would most likely cause the design to lose features, which it did. The purple design had an apple on the back, again this design was not attached to the back of the iPad stand, however we made the decision to continue with the print as we were going to attach it after the fact with superglue. Level of Difficulty: Low - this is a basic design from the main Tinkercad Interface. The shape manipulation is minimal, just needed to be in relation to holding an iPad Mini. There is considerable scope for the design to have variation. Neither dimensions (see below) were consistent, but the basic design principals remained. Above: Purple design shown close up. Time frame: The green print was sixteen hours and the purple print was twelve. This excludes the additional features of the print which are being selected to be added to the rear of the design. Given the dimensions both could have been similar size and the 'green' one reduced, as they were serving the same purpose. The standard 20% infill and 8mm nozzle settings as is the case for nearly every print on this site was applied. Size: There are two distinct prints for this project. The dimensions of the Green Print and the dimensions of the Purple Print. The green print which is clearly the larger of the two had a front of 100mm. It was 100mm long and 150mm high. The block at the front was 10mm by 10mm by 10mm. The block at the back that formed the basis for the name was 20mm across. The lettering that formed the basis of the name was raised 5mm. The purple 'Kade' print was 90mm across, was 70mm deep with a block of 10mm by 5mm. The block at the back for the lettering was 120mm high. The lettering was 7mm high. What we would do differently/next steps for students: As a basic design these prints worked well and were a good introduction, particularly for the mainstream student. We could look to included storage at the base of the design as we have profiled in other prints that are on this site. Keeping the names simple and having them facing upwards, as shown was key in the success of the print. Challenge: Student have previously created a significant Glow-In-the-Dark print - which was featured on this blog at the start of the year. Background: The horse had been printed onto its own stand, however due to an accident the horse was damaged. The idea behind this print was to take the damaged print and salvage it to make it useable again. The student needed to consider the balance of the horse - and produce a way in which to hold it in place and also the consider its composition. With the original print snapping at the legs a decision was made to use pliers to remove the legs at approximatley the same point. The student then created the base to work in conjunction with the print. 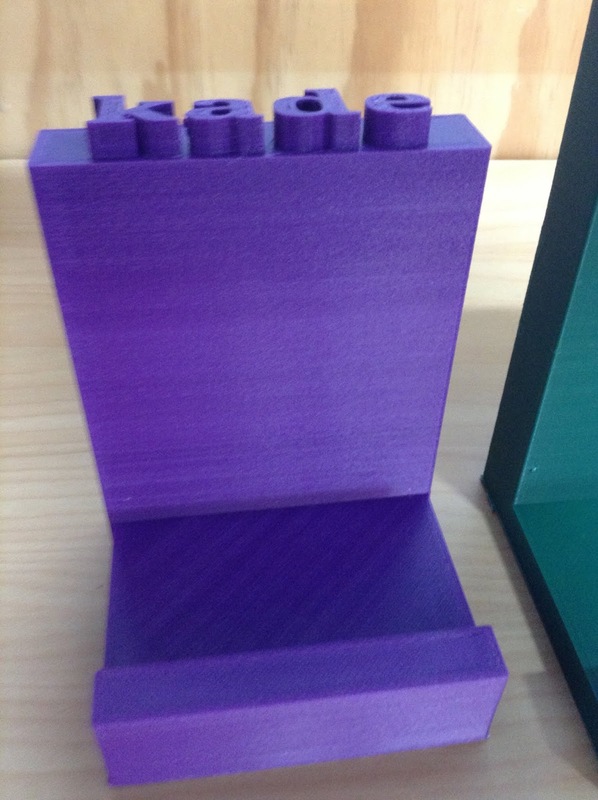 The student choose to feature their name on the base as shown in the photograph and was completed successfully on the first print. This allowed a broken print of significant size to be used in a meaningful way. Level of Difficulty - Low - the print itself is a previous version of a design that was found online and freely available. The design of the base of the print, the lettering and the jumping horse poles were all straightforward items and options from the main Tinkercad interface. Time frame: Six hours - this was conceivably longer than should have occurred as the student created a base that was 10mm thick and could easily have created the design with a 10mm base. The width and lettering on the design was about right for the project. Size: the measurement dimensions of the project were 70mm by 70mm for the duration of the design. Width of the design as noted. The lettering was 20mm high. Given the purpose of the design and the size of the horse that it needed to be the base for these dimensions was correct - although the thickness of the base as noted could have been reduced. What we would do differently/Next Steps for Students: This took a broken significant print and re-used a key part of it in a meaningful and successful way. Challenge: To produce and personalize a desk organizer/storage device with a batman theme as a gift for someone. Background: This came about as an original design worked on by three students who had worked with the 'Mr Bloor' in the design. They wanted to create an original gift for him and give it to him, with it having a practical use. The original design featured three different versions of this print. The three all had different storage and props as part of the design. 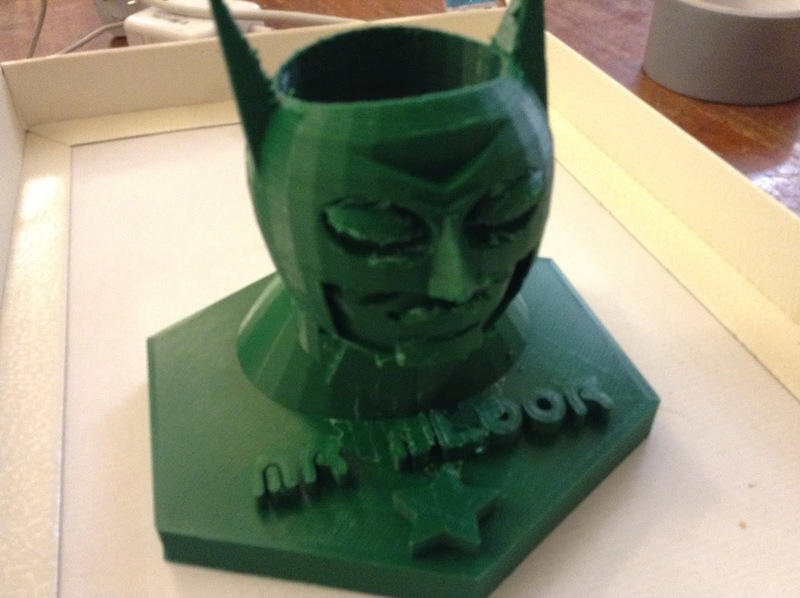 When the three students met together to discuss the print they identified that the different objects as part of the design (boxes, storage etc) meant that the Batman head was not able to dominate the design in terms of size and functionality. As a result the earlier designs were scrapped in favour of this version that focused on the 'Batman design' as the dominating feature and being able to hold a significant amount of stationary. The personalized part of the design obviously came from the name going on the base of the design. The 'Batman' head was a readily available from Tinkercad as a publicly available design for use. Level of Difficulty: Medium - the design featured was straightforward and was easily created once the students had sourced the 'Batman' that was the key piece of the design. Once it had been selected it was simply a matter of resizing it, dropping a hole into the design to hollow it out, and then placing it on a stand. While these are very basic steps they needed to all work in unison to be successful. Time fame: Seventeen hours - this design was the right size for the project, consideration could have been given to reduce the height of the base, this would have reduced the print time, the base as it stands was 10mm thick and could have been made 5mm. Size: The base of the design was a hexagon that had 80mm sides. The thickness of the base was 10mm. The entire design had a length across of 140mm. The lettering for the name was 80mm in length and 5mm high. 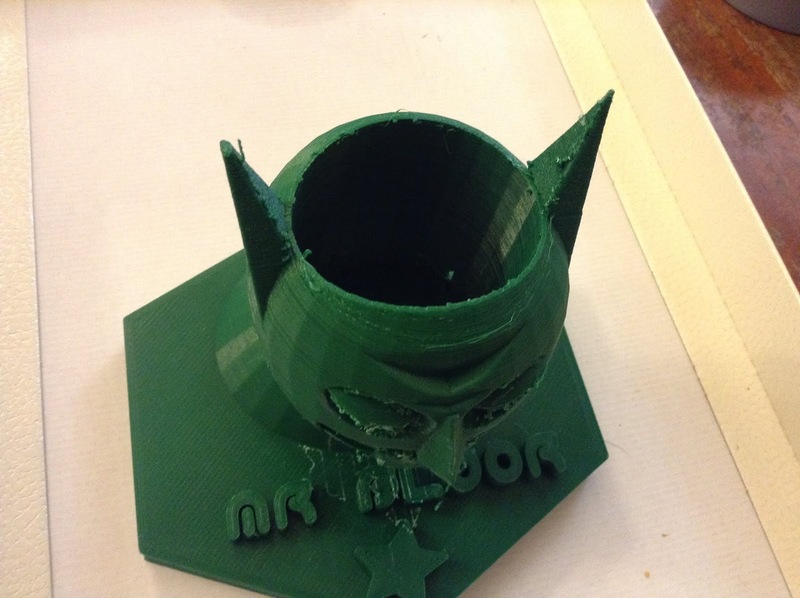 The 'Batman' design, which was the focus for the print was 90mm across and the point of the ears was 120mm. These dimensions would have been about right for the print given the original plan and idea. What we would do differently/Next steps for students: The print featured facial designs that included significant rafting that needed to be gently removed. This has left some filament that has remained on the facial area of the design. This can be removed however it is a process that takes time and care to get it right. There are several products that are available to assist with this process. 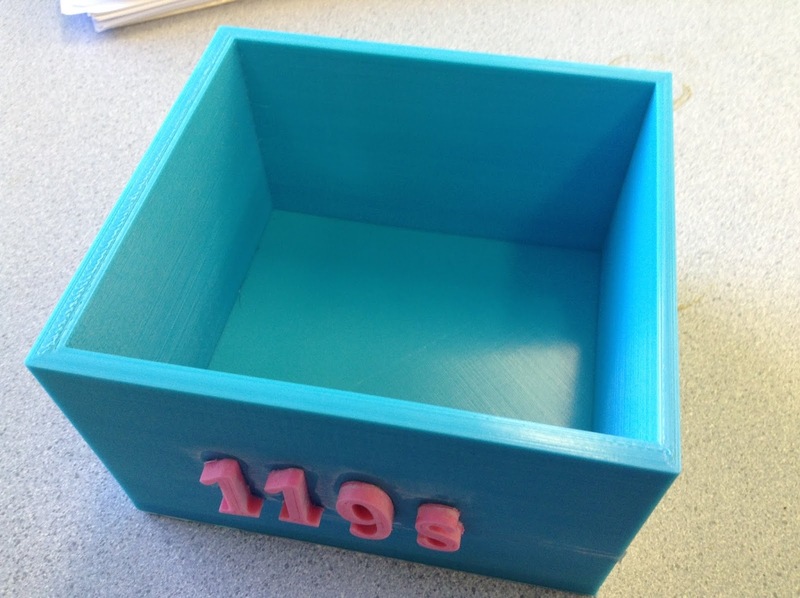 Challenge: Student wanted to create a personalised storage box that reflected their nick name and a special interest that they had. Background: The student wanted to combine PLA (print colour) and produce a print that would allow themselves storage for a variety of items. The emphasis was producing a straight forward design, but to include a variety of items make it as large as feasibly possible. To really make the letter stand out the decision was made to include the lettering on the outside in a different colour. In the past these designs had included a single colour with the lettering as part of the initial print. The student had limited personal experience in 3D Printing however they were influenced by a number of other students and projects that they had seen in the classroom. They also decided (with assistance) to experiment by creating a 'shadowing' effect this was created by putting a 1mm font into the side of the print. This proved to be extremely effective. 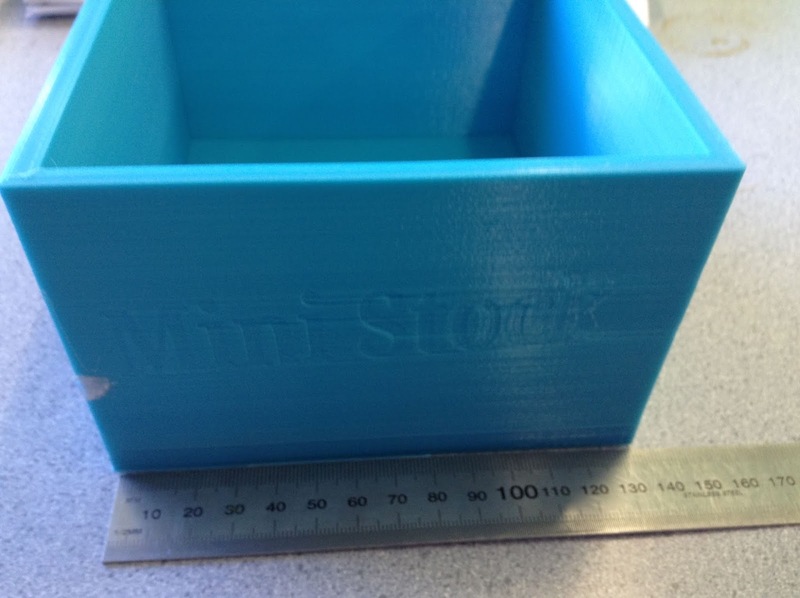 You can view this effect by looking at the photograph below and looking closely at the 'Mini-Stock' lettering. This was the first time that we had attempted this with a 3D Print and the students concerned along with the wider class were extremely impressed with the results. Level of Difficulty: Medium while the deisgn itself is a basic box shape there were additional features that increased the difficulty of the print. Apart from the shadowing from the sunken in font there was the additional lettering that was produced for the outside of the box in the different colour. This had to be sized and designed relative to the size of the box. This was attatched to the box by using regular superglue. Timeframe: Twenty hours printing for the box itself. One hour printing for the additional lettering. Potentially the timeframe to print the box could have been reduced by reducing the width of the size of the box. Size: The box measured 130mm across, and was 100mm high. The thickness of the box itself was between 3mm and 5mm (there was one side that was uneven due to a mistake in the planning of the design). The Letterering that formed the outside of the box was between 2mm and 3mm by 5mm. What we would do differently/Next Steps for students: Other than evening the sides there is very little that would be done in practicality to differ in the making of the box. Student is now moving onto other projects and a number of students are looking at the inclusion of the shadow font.